Cyber criminals are mounting attacks with increasing complexity and sophistication, using coordinated means to gain access to your network from any and every connection. Security measures must keep pace by adding detection capabilities across networks and endpoints, as well as the ability to correlate this event activity into targeted action. WatchGuard’s Threat Detection and Response (TDR) service correlates network and endpoint security events with threat intelligence to detect, prioritise and enable immediate action to stop malware attacks. TDR enables small and midsize businesses and the Managed Security Service Providers (MSSPs) that support them to confidently remediate advanced malware attacks before business-critical data or organizational productivity is compromised. Best of all, TDR is included with the Total Security Suite, providing a comprehensive set of security services through one SKU and one platform. Threat Detection and Response enables users to easily scale and manage their security. The cloud-based service makes it easy for administrators and operators to quickly deploy Host Sensors across their entire organisation, create policies and perform one-click remediation. 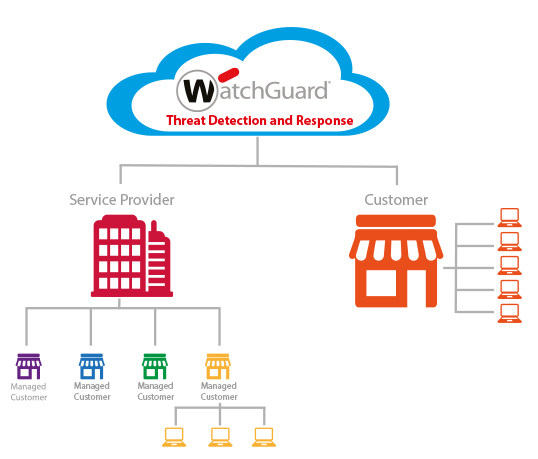 WatchGuard’s Threat Detection and Response service provides enterprise correlation capabilities for small and midsize businesses and distributed enterprises. Don’t just think there might be a problem, know if there is with industry-leading solutions that help illuminate your endpoint, detect and correlate threats, and protect your most important assets. Why WatchGuard Threat Detection and Response?